The videos module displays a list of videos. The list can be ordered and filtered in numerous ways including by category, album, playlists, date and author. There are several layouts to choose and can be shown in an animated carousel which opens videos directly in responsive lightboxes on the same page. The images module displays a customizable slideshow of images in a carousel. Choose which images are displayed using the parameters in the administaror. You can select whether the module should automatically scroll through the images or wait for a user to cycle through. You can also determine the time interval between the scrolling if automatic is selected. The audio module displays a list of audio tracks with an audio player, and allows users to listen to all the tracks in the list. There are multiple options in the module parameters which allow the administrator to control the audio tracks which are displayed. The media module displays a customizable list of media, that can show the title, thumbnail and other information about the item. There are multiple options in the module parameters which allow the administrator to control the items which are displayed, and the list can be restricted to a single media type, for example images, or videos. The administrator can also control which data is displayed. There are several templates to choose from. The media playlist module displays a customizable list of playlists. Set the amount of playlists you want to show as well as filtering the playlists to only show those you desire. Set the order in which they shall display and which details are shown. The media group module displays a customizable list of groups. Set the amount of groups you want to show as well as filtering the groups to only show those you desire. Set the order in which they shall display and which details are shown. The media channel module displays a customizable list of user channels. Set the amount of channels you want to show as well as filtering the channels to only show those you desire. Set the order in which they shall display and which details are shown. The media categories module displays a customizable list of media categories. Set the parent category from which you want the categories to show as well as whether the descriptions and subcategories are shown. The media album module displays a customizable list of media albums. Set the amount of albums you want to show as well as filtering the albums to only show those you desire. Set the order in which they shall display as and which details are shown. The media item module displays a single media item of any type. You can set it to be a specific item, a random item or the newest item. The activities module displays a customizable feed of activities, from your site's users, in a list. From adding new media, sharing media with a group, to favouriting or liking media. This module will let you display what your users have been doing on your site. The search plugin allows your users to search for media directly from the Joomla search plugin, and see media results listed along side other items from your site such as articles. The media editor button plugin extends your Joomla editor and inserts a Media button. The button allows you to easily insert content from HWDMediaShare into your Joomla articles, and other pages of your Joomla website. The media content plugin allows you to insert content from HWDMediaShare into your Joomla articles, and other pages of your Joomla website. The JomSocial media application is a JomSocial app which shows content from HWDMediaShare on the JomSocial user profile page. The DISQUS plugin allows you to use the DISQUS commenting solution within HWDMediaShare. The Facebook commenting plugin allows you to display the Facebook comment box to allow users to discuss media items. The JComments plugin allows you to use the JComments commenting solution within HWDMediaShare. The Komento plugin allows you to use the Komento commenting solution within HWDMediaShare. The AmazonS3 plugin uses the HWDMediaShare CDN framework, and allows you to automatically transfer any new uploads to your AmazonS3 bucket after conversion has occurred. This gives a powerful, expandable and fast delivery network, and reduces bandwidth from your own server. Our HWD JWplayer plugin allows you to play your HWDMediaShare videos in the JWplayer. Our HWD Flowplayer plugin allows you to play your HWDMediaShare videos in the Flowplayer. The MediaElement.js media player plugin allows you to use the MediaElement.js player to show videos and audio in HWDMediaShare. The Youtube remote plugin allows you to integrate Youtube with HWDMediaShare, so that you and your users can import and seamlessly display Youtube videos in your video gallery. The Dailymotion.com remote plugin allows you to integrate Dailymotion with HWDMediaShare, so that you and your users can import and seamlessly display Dailymotion.com videos in your video gallery. The Vimeo.com plugin allows you to integrate Vimeo with HWDMediaShare, so that you and your users can import and display Vimeo videos from within HWDMediaShare. The Flickr.com remote plugin allows you to integrate Flickr with HWDMediaShare, so that you and your users can import and seamlessly display Flickr.com photos and images in your photo gallery. The Soundcloud remote plugin allows you to integrate Soundcloud with HWDMediaShare, so that you and your users can import and seamlessly insert Soundcloud tracks in your audio gallery. The Blip.tv remote plugin allows you to integrate Blip with HWDMediaShare, so that you and your users can import and seamlessly display Blip.tv videos in your video gallery. The Veoh.com plugin allows you to integrate Veoh with HWDMediaShare, so that you and your users can import and display Veoh videos from within HWDMediaShare. The Youku.com plugin allows you to integrate Youku with HWDMediaShare, so that you and your users can import and display Youku videos from within HWDMediaShare. The Vevo.com plugin allows you to integrate Vevo with HWDMediaShare, so that you and your users can import and display Vevo videos from within HWDMediaShare. The Metacafe plugin allows you to integrate Metacafe with HWDMediaShare, so that you and your users can import and display Metacafe videos from within HWDMediaShare. The Myspace remote plugin allows you to integrate Myspace with HWDMediaShare, so that you and your users can import and seamlessly display Myspace videos in your video gallery. The Yahoo.com plugin allows you to integrate Yahoo.com with HWDMediaShare, so that you and your users can import and display Yahoo.com videos from within HWDMediaShare. The Vine plugin allows you to integrate Vine with HWDMediaShare, so that you and your users can import and display Vine videos from within HWDMediaShare. The Foxnews.com plugin allows you to integrate Foxnews with HWDMediaShare, so that you and your users can import and display Foxnews videos from within HWDMediaShare. The Google videos plugin allows you to integrate Google videos with HWDMediaShare, so that you and your users can import and display Google videos from within HWDMediaShare. The Wat.tv plugin allows you to integrate Wat.tv with HWDMediaShare, so that you and your users can import and display Wat.tv videos from within HWDMediaShare. The Extreme remote plugin allows you to integrate Extreme videos with HWDMediaShare, so that you and your users can import and seamlessly display Extreme videos in your video gallery. 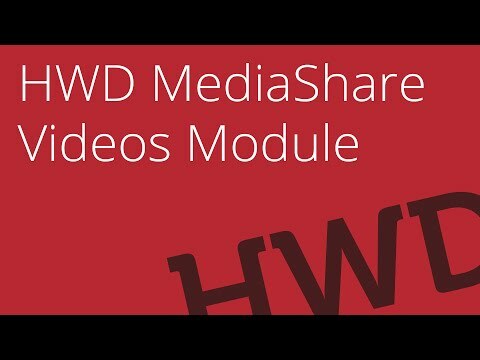 Our Xmap - HWDMediaShare Plugin allows you to use Xmap with HWDMediaShare.